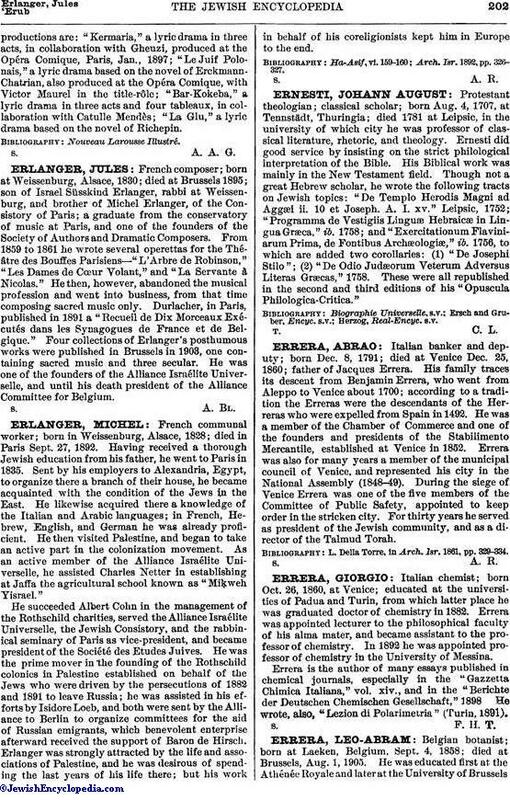 Italian banker and deputy; born Dec. 8, 1791; died at Venice Dec. 25, 1860; father of Jacques Errera. His family traces its descent from Benjamin Errera, who went from Aleppo to Venice about 1700; according to a tradition the Erreras were the descendants of the Herreras who were expelled from Spain in 1492. He was a member of the Chamber of Commerce and one of the founders and presidents of the Stabilimento Mercantile, established at Venice in 1852. Errera was also for many years a member of the municipal council of Venice, and represented his city in the National Assembly (1848-49). During the siege of Venice Errera was one of the five members of the Committee of Public Safety, appointed to keep order in the stricken city. For thirty years he served as president of the Jewish community, and as a director of the Talmud Torah. L. Della Torre, in Arch. Isr. 1861, pp. 329-334.